The RIIoT™ Parts describe the different parts you can use to build your RIIoT™ Network, and the RIIoT™ Tools are developed to support a project with fast to market requirements. We strive to make the tools easy to use and make the documentation easy to follow. The RIIoT™ Net Controller is a middleware for Linux based gateways/concentrators to interface a customer gateway application with RIIoT™ network. The RIIoT™ Net Controller is designed to operate together with the RIIoT™ GPR module. Radiocrafts delivers the RIIoT™ Net Controller as a pre-compiled executable application with example integration applications. RIIoT™ will operate without the RIIoT™ Net Controller, but with reduced functionality in terms of cloud support and network monitoring. See the GPR module description. Interested in the RIIoT™ Net Controller, please click here to find the RIIoT Net Controller Socket API Reference. 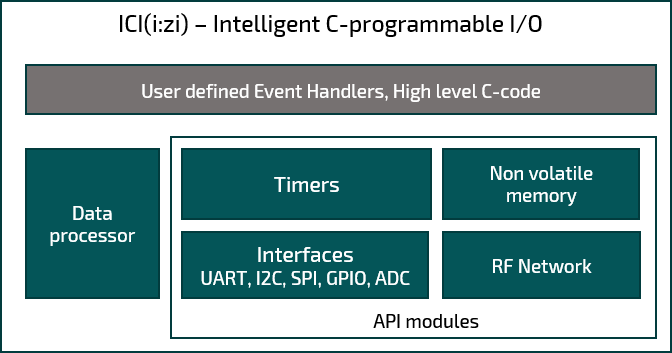 RIIoT™ Net Controller is now available for download here. The SPR Module is a complete, very low power-consuming IEEE802.15.4 g/e RF node with a 50 ohm antenna interface. The low power version has an output power of 14dBm and the high power has an output power of 26dBm. The 12 dB difference in output power translates approximately to 4 x in increased range using the high power version versus the regular version. The module can be set to support either a 5kbps data-rate or a 50kbps data-rate. This is configured in the firmware . The lower data rate allows for longer range at the expense of longer Tx pulse. The range increase is doubled using the lower 5kbps data-rate vs the 50kbps data-rate. The module includes the ICI I/O. Please click here for more details on the ICI I/O. Click here to find the datasheet for the SPR Module. The GPR module is the core to enable a RIIoT™ gateway. It can either be integrated as is into the gateway itself or it can be accessed from the gateway by connecting a RIIoT™ gateway dongle via USB. The GPR module communicates to the RIIoT™ Net Controller to get the full RIIoT™ performance in the gateway. The GPR Module can interface with up to 65,000 SPR modules. Users may also create applications that directly interface (via UART) with the GPR module if full RIIoT™ functionality is not needed. The low power version has an output power of 14 dBm and the high power has an output power of 26 dBm. The 12 dB difference in output power translates approximately to 4 x in increased range using the high power version versus the regular version. The module can be set to support either a 5 kbps data-rate or a 50 kbps data-rate. This is configured in the firmware. The lower data rate allows for longer range at the expense of longer Tx pulse. The range increase is doubled using the lower 5 kbps data-rate vs the 50 kbps data-rate. Interested in the GPR Module, please click here to find the datasheet. The RIIoT™ Gateway Dongle is a complete CE certified boxed product that will expand a standard Linux gateway to a gateway with RIIoT™ functionality. This is done via a USB connection. The RIIoT™ Net Controller needs to be included in the “Linux environment” of the gateway to get the full RIIoT™ functionality. The core of the gateway dongle is the GPR module. The additional blocks are a USB transceiver, a PCB, and the antenna. 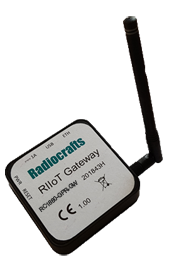 Please click here to find the RIIoT™ Gateway Dongle datasheet. The RIIoT™ Tools are developed to support a project with fast to market requirements. We strive to make the tools easy to use and make the documentation easy to follow. The RIIoT™ SPR SDK supports the development of code for the ICI I/O in the SPR module. The ambition when Radiocrafts developed the ICI I/O was that a user should be able to write any application for sensors/controllers in less than 100 lines of high-level C-code, driving a straight forward solution for the C-programmer. The RIIoT™ SPR SDK is available for download here. The RIIoT™ SPR SDK User manual is available here. The RIIoT™ Gateway Software Package includes tools and firmware to set-up a RIIoT™ network with the GPR Module and a standard Linux based gateway. The ambition is to make the set-up process as easy as possible, while still maintaining the ability for the user to set up key network parameters to optimize for a specific network’s requirement. The RIIoT™ development kit includes all the hardware needed to start running a small RIIoT™ network from a PC. This allows the customer to test the network capabilities with minimum development resources needed. This is ideal for a first range test in a customer environment. The RIIoT™ development kit includes three boards with antennas, power supplies, and a USB cable for PC connection. A RIIoT™ sensor board, a board with an SPR Module and 5 industrial sensors. AN028: Connecting Many Sensors To The Cloud in IIoT: RIIoT To Cloud Setup Guide This application note demonstrates how to setup a commercial off-the-shelf (COTS) gateway for RIIoT™, and how to integrate it with an easy-to-use IoT cloud service provider. AN027: RIIoT Range - Basics and Measurements Results Learn everything you need to know about understanding range from LoS to antenna design and more. Also read about the impressive RIIoT™ range measurements conducted by Radiocrafts both in urban and LoS areas. AN026:One Common Footprint For Many Technologies There are many different wireless standards and technologies available to enable the internet of things (IOT). The different technologies have different pro’s and con’s depending on the use case and the end customer. Trying to keep up with the latest wireless trends can drain a company of all its resources and take attention from its core business. The solution recommended by Radiocrafts is to use a modular approach and a common RF module footprint that enable all the technologies offered by Radiocrafts without modifications to the PCB.